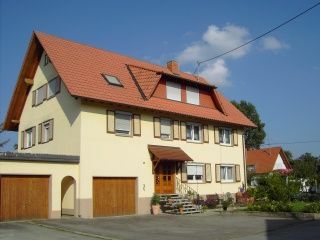 Our house is a 3 family house, the upper floor is set up as an apartment, very cozy and functional. We have a large lawn with garden chairs and a beautiful gazebo. Our Hegau landscape amidst the volcanic mountains a unique beautiful landscape. Apartment from 3 nights for 2 pers. 33 - € per night plus. 10 - € per additional person. No further costs are incurred all inclusive. Check please from 16 clock Please departure 11 clock Connection to the highway about 5 KM; to the Swiss Limit (Shortly before Schaffhausen) about 12 KM. Until Lake Constance is about 30 km (moss) in Radolfzell. 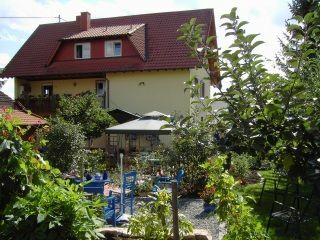 Our place is a quiet village with 900 inhabitants, shops are available in town.